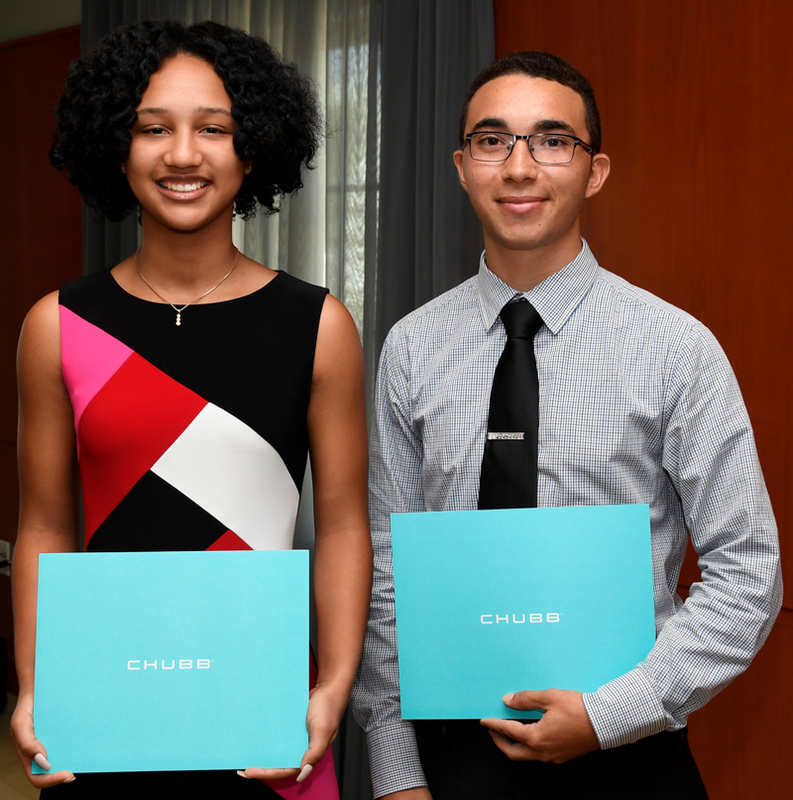 Karina Forth and Nathanael Fubler are this year’s Robert Clements Scholarship and Bermuda College education Award recipients, the Chubb Charitable Foundation – Bermuda announced. Karina Forth, a recent graduate of the Bermuda High School for Girls, has been selected as the 2018 Robert Clements Scholar in the award’s twenty-second anniversary year. She is entering her freshman year this fall at the University of Western Ontario, where she will be pursuing a Bachelor’s degree in Business Administration. During her time at Bermuda High School, Karina received many academic awards, specifically honoured for her achievements in Math, and was recognized as the 2017 CAS Award recipient for her passion and commitment towards Community Service. In addition to her academic accomplishments, Karina has been a devoted dancer at United Dance Productions, where she has studied the disciplines of modern, tap, ballet, jazz and hip-hop. In recognition of her dedication, hard work and perseverance, Karina received the Outstanding Teen Award for the Performing Arts in 2018. Karina’s community service accomplishments include peer mentoring of Year 5 students at Northland’s primary school and assisting at BHS’ Autism Playgroup, where her aim was to help improve the communication skills in autistic children. “Karina has been described as “passionate”, “committed” and “exceptional”, and the Scholarship Selection Committee agreed! She impressed the committee with her academic strength and her dedication to her art, both of which she balances at the highest level. As the 2018 recipient, we look forward to having Karina join the outstanding family of Robert Clements scholars”, said Lori Dunstan, Chair, Chubb Charitable Foundation – Bermuda. Over the past 22 years the Chubb Charitable Foundation – Bermuda, through the Robert Clements Scholarship and other discretionary awards, has invested in excess of $2.7m in support of 28 Bermudians to help them prepare for professional careers in Bermuda’s insurance industry. The fully-funded four-year scholarship is open to Bermudians studying for an undergraduate or graduate degree in insurance, risk management, actuarial science or other disciplines related to the insurance industry including accounting, law, and economics. The scholarship offers students the opportunity to study for a degree without financial worry as well as employment opportunities during the holidays to provide them with relevant work experience. Recipients must be willing to return to Bermuda on completion of their studies to pursue a career in the insurance industry. Nathanael Fubler, a recent Honours graduate, has been selected as the 2018 Bermuda College Education Award recipient. Nathanael will be commencing a Bachelor’s Degree in Actuarial Science this fall at Georgia State University in Atlanta, Georgia. Nathanael has proven to be an exemplary student, consistently achieving honours throughout his time in secondary school. Prior to studying at Bermuda College, Nathanael attended CedarBridge Academy where, as an accelerated student, he completed four IGCSE’s and graduated one year early. In 2017, Nathanael was also named on the Bermuda College Vice President’s list. In addition to his academic achievements, Nathanael’s extracurricular activities include volunteering with Field Service Ministry and providing tutoring services to young children. He also expresses a great interest in music. Nathanael has participated as a member of the Bermuda Youth Orchestra and CedarBridge Concert Band until graduating in 2016. Nathanael believes his experiences as a musician has helped develop his craft as both an artist and performer. The Bermuda College Education Award provides $15,000 a year for two years to the successful Bermuda College graduate to assist them with the continuation of their undergraduate studies overseas. Since inception, the Chubb Charitable Foundation-Bermuda, has invested in excess of $300,000 in financial support of 14 Bermudians to help them prepare them for a successful career. The Bermuda College Education Award was launched in 2008 as one component of partnership formed between Chubb and the Bermuda College. The goal of the partnership is to expose students to a business environment and prepare them for a successful career by helping them understand the connection between their studies and the workplace. This is achieved through several initiatives such as mentoring, networking events, and employment opportunities. Good Job Karina. Congrats to both awardees. proof that hard work and determination pays huge dividends. A BIG THANK YOU to Chubb for making these scholarships possible. We are blessed to have so many businesses give back to the community.